Catalogue of equipment Tion. Air purification systems. Finishing ventilation device. Integrated into the ceiling, supplying sterile air in a vertical one-direction flow to the clean zone. 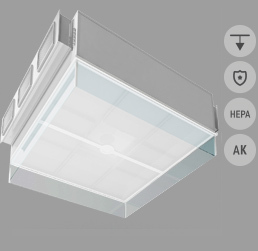 Tion В Lam is a ceiling device for one-direction sterile air flow supply for protection of patients from infection in the surgery boxes, intensive care wards, etc. Used also for reduction of the volume of air supplied from the outside by means of recirculation through Tion B Lam for reduction of the ventilation power consumption. 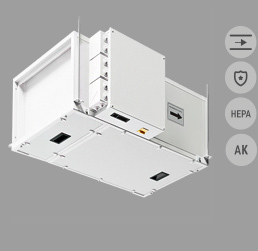 Integrated in the duct of supply or exhaust ventilation in suspended or floor-mounted position. The rate through the device is regulated by the ventilation performance. Tion В is an integrated air cleaning and disinfection device. Tion B is installed in the supply ventilation duct where the set cleanroom class of the medical facility needs to be ensured by means of clean air supply. It is installed in the exhaust duct of infection disease premises to ensure air safety outside the building. 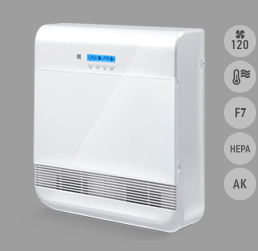 Tion В120 is an integrated supply ventilation system with air disinfection, deep cleaning and heating function with climate control. It does not require air duct laying and can be installed in the conditions of finishing renovations. It is used in medical facility premises where a central ventilation system is absent or is inefficient. Tion A is a bactericidal recirculator with an integrated air cleaning and disinfection function for premises with increased requirements to air cleanness. Modern alternative for UV irradiators, recirculators, etc. No lamps: no more lamp wiping, inspection or time logs are required. The Tion medical equipment ensures the improved level of air disinfection and cleaning and has a registration certificate for medical equipment. Breezer Tion O2 is a space-saving supply ventilation system which does not require renovation of the premise or air duct laying for installation. It is used as a solution for ventilation of minor premises, including living quarters and offices. The air supplied undergoes deep cleaning and is heated when necessary up to the set temperature (climate control function). Integrated in the supply ventilation duct in suspended or floor-mounted position. The rate through the device is regulated by the ventilation performance. 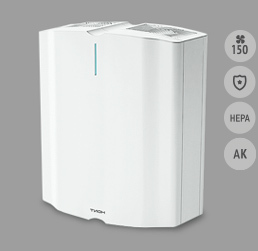 Тion Eco is an integrated air cleaning and disinfection device for supply ventilation systems. It is used for air dedusting, and cleaning from harmful substances. It is also used as a bactericidal disinfection filter for the recirculation branches for hall premises, archives, museums, any residential and public buildings, and production facilities. Integrated in the exhaust ventilation duct in suspended or floor-mounted position. The rate through the device is regulated by the ventilation performance. 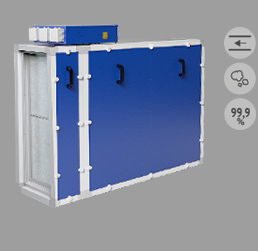 Тion Ext is a device for air cleaning in exhaust ventilation systems of buildings from smoke, aerosols, particles, harmful substances and odours. It cleans air from any strong contamination sources including burning products of combi steamers and all types of furnaces (excluding wood ones) as well as from tobacco smoke and harmful emissions during beverage and food production. Integrated in the exhaust ventilation duct mounted on the floor downstream from the spark arresting device and the fat collector. 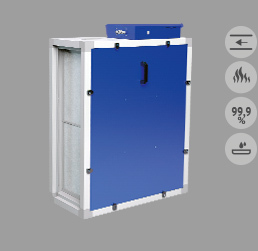 The rate through the unit is regulated by the ventilation performance. Designed for air cleaning from burning products of wood barbecues and stoves. Тion Ext Advanced is a specialized device for ventilation air cleaning from burning products at catering facilities: restaurants, bars, coffee shops and other places with cooking. It cleans the air from coarse contaminants in high concentrations (including particles of soot, fly ash, fat drops, smoke, odour, etc.) produced by wood-burning stoves, barbecues, etc. 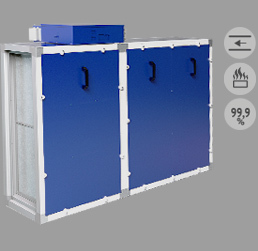 Designed for air cleaning from emission products, including the products of burning. The efficiency of soot, fly ash, fat, smoke, etc. filtration is at least 99.9%. Tion Clever is a professional integrated air cleaner. The use of Tion Clever in the presence of people (houses, offices, kindergartens, beauty shops, beauty salons, hotels, etc.) is efficient for prevention of airborne contaminations because the device destructs infections straight on filters due to inactivation. Effective for highly allergic individuals. Tion implies a medical technology adapted for the ‘civil market’ for air cleaning and disinfection in living quarters and offices, archives, food production facilities, restaurants, etc.